Keep Your Community in the Loop! 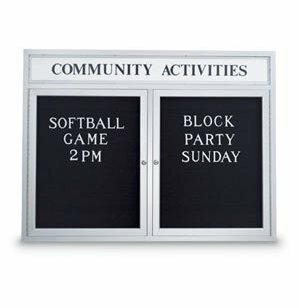 These Weather-resistant Enclosed Letterboards are durably designed for years of trouble-free outdoor use. 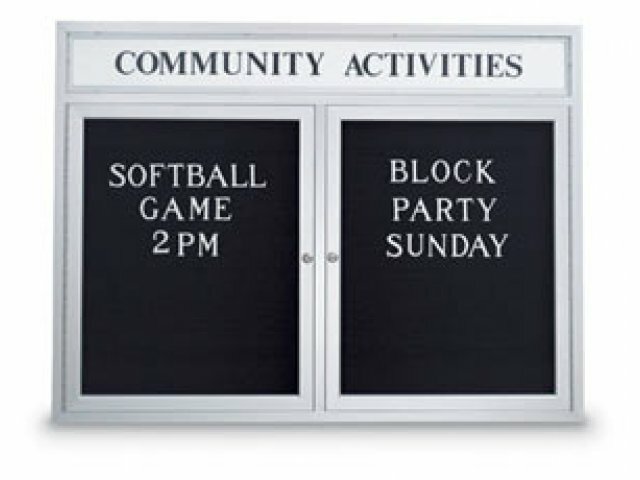 United Visual manufactures a wide range of indoor and outdoor bulletin boards, communication boards, corkboards and more. Their creativity and innovative ideas have quickly made them a respected name in the visual communication industry. Black Hevetica lettering is provided on header at no extra charge. Make sure to specify your header text in the "Special Instructions" box when checking out. Vinyl letter board with horizontal grooves (on 1/4" centers). 290-pc 3/4" Helvetica letter/number set included. Lockable doors mounted on full-length piano hinges (two keys included). Weather-resistant aluminum backing with silicone sealant. Custom header logos available for additional charge (camera-ready artwork or EPS computer file required). Note: This unit should be installed under a roof or overhang. It is not designed for direct exposure to the elements.